Casing is pipe or tubing of appropriate material, diameter and weight used to support the sides of a well hole and prevent the walls from caving, to prevent loss of drilling mud into porous formations and to prevent fluid from entering or leaving the well. A typical well is constructed of several lengths of casing strings, which are full lengths of similar diameter casing. An operator of a well must ensure surface casing for a well conforms to a number of requirements that will vary across the country. Generally, non-toxic drilling fluids are used during the drilling of a well until all porous strata that contain non-saline groundwater that is usable for domestic or agricultural purposes have been isolated from the drilling fluid. The porous strata or potential aquifers are isolated from drilling fluids and future oil and gas activities related to the wellbore by setting surface casing. Typically, surface casing must be set below the base of all strata known or reasonably expected to serve as a source of potable water, and the annulus (space between the wellbore and the steel casing string) must be filled with cement to the surface. Cementing is the process of permanently securing the casing to the wellbore or plugging and sealing the wellbore. The drilling of an oil and gas well is accomplished in phases and each phase ends by successfully securing casing string in the wellbore. Conductor casing: The purpose of this casing string is to maintain the uppermost sides of the wellbore, which can commonly encounter unstable and unconsolidated material. 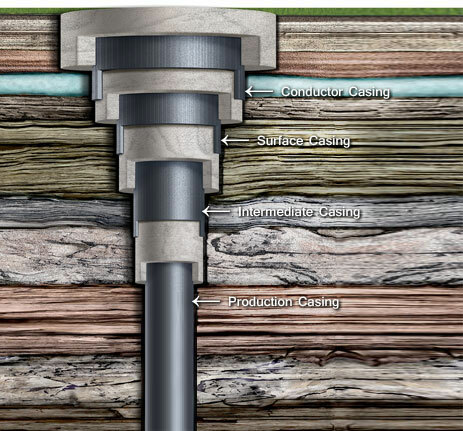 Surface casing: Following conductor casing being set, drilling continues still using non-toxic drilling fluids until the base of all strata known or reasonably expected to serve as a source of drinking water have been penetrated. The surface casing string is run from ground level or surface to the bottom of the wellbore. Cement is pumped down the inside of the casing, and the annulus (space between the wellbore and the steel casing string) must be filled with cement to the surface. A volume of fresh water follows the cement that has been pumped down the casing string until circulation is established. Circulation ensures the entire annulus has been filled with cement. Intermediate casing: The next set of casing is intermediate casing, but it may not be required in all wellbores. Generally, it is set in place when additional control of fluid flow and/or pressure is required, or to protect other subsurface resources. Production casing: The last set of casing to be secured. This casing is set, generally, into or just above the targeted formation. If the production casing is set just above the target formation, the well is considered to be ‘open hole’. The production casing is set into place in the same fashion as surface and intermediate casing.